Olympia oysters in Washington. Photo courtesy of NOAA. Native shellfish in Washington state are of high ecological, economic, cultural, and recreational value. Ecologically, many of them filter nearshore waters, contributing to water quality. They also serve as predictable sources of food for carnivores in nearshore habitats. Others are predators that are part of the ecological balance of nearshore ecosystems. Most have larvae or juveniles that spend time in the water column, where they provide food for a variety of valued fishes. Culturally, they have been a critical part of the subsistence and culture of native peoples for centuries. Economically, nearshore shellfish in Puget Sound have a commercial value of almost $100 million a year; roughly $60 million of this is from sales of the non-native Pacific oyster, but more than $40 million is from native crabs, clams, and mussels. Recreationally, personal harvest of shellfish is a very popular activity despite problems with water quality in many regions. Native shellfish in Puget Sound are diverse, both in terms of species and in the ways that they use nearshore ecosystems. Species include crabs, numerous clams, the Olympia oyster, mussels, shrimp, abalone, and various others. In Puget Sound, all major shellfish species, with the exception of shrimp, use nearshore ecosystems for part or all of their life histories. This white paper focuses on geoduck clams, Dungeness crabs, hardshell clams, and Olympia oysters. Geoduck clams are especially abundant in the south sound, buried deeply in mud or sand in the low intertidal and subtidal zones. Dungeness crab are present throughout the state’s waters but in Puget Sound are most abundant in the northern portions. Adults are found primarily in the subtidal zone in soft sediments, but the juveniles rely heavily on intertidal habitats with structural complexity, such as eelgrass beds. Their larvae spend long periods (months) in the water column before returning to the nearshore zone to settle. Hardshell clams, including littleneck, butter, and horse clams, are abundant throughout Puget Sound, primarily in the intertidal and shallow subtidal zones. All prefer sediment mixed with gravel or cobble, and their populations are sometimes enhanced by adding gravel to sandy or muddy beaches. Native Olympia oysters grow best in shallow subtidal muddy habitats but prefer to settle as larvae onto pieces of harder substrate such as shells or pebbles. Populations of native oysters have virtually disappeared due to overharvesting and pollution, but there are increasing efforts to reestablish them. Few data exist on the status of natural populations of these shellfish, or on their trends through time. The Washington Department of Fish and Wildlife (WDFW) has been tracking both recreational and commercial exploitation of many species since the 1970s. Landings of most species have stayed roughly the same or have increased during this time period. In most cases, however, data on catch per unit effort (as for commercial fisheries) are lacking, so harvest increases may simply be the result of greater effort. Recreational harvest rates of clams per trip (a catch-per-effort statistic) have been fairly stable since 1990, although the harvest of several native clams appears to have declined relative to introduced Manila clams, which are easier to dig. The only shellfish that has clearly undergone a major decline in natural populations is the Olympia oyster, which is no longer commercially viable. There are also concerns about long-term declines in geoduck populations. Even for apparently stable populations, however, there are clearly problems in Puget Sound; water quality issues often affect peoples’ ability to use shellfish. Threats to shellfish in Puget Sound come from a variety of directions. As illustrated by Olympia oysters, commercial and recreational overharvesting can be an issue. The trend toward aquaculture reduces the pressure on native populations, but most cultured species are non-native. However, virtually all shellfish are affected by human alterations of key ecosystem processes, such as sediment supply. All the shellfish described in this report have distinct types of sediment in which they recruit and/or grow the best; thus, any process that alters sediment amount, grain sizes, organic content, etc., may negatively impact local shellfish populations. These alterations can come from changes in runoff from land, in sediment loads carried by rivers and streams, and in sediment supply from bluffs that have been hardened. Many of these processes could be restored, with likely positive impacts on shellfish. Shellfish in both adult and larval stages are also strongly affected by water column characteristics. Key parameters include temperature and salinity, turbidity, oxygen, pollutants, and food types and concentrations. All these can be affected by land use, shoreline modifications, stormwater and sewage discharge, industrial discharge, and other human activities, many of which could be restored either locally or throughout the sound. Factors that humans can alter, to the detriment of shellfish, include habitat characteristics like the abundance of eelgrass and the type and abundance of predators, competitors and parasites (e.g., aiding the establishment of invasive species). Dethier, M. (2006). 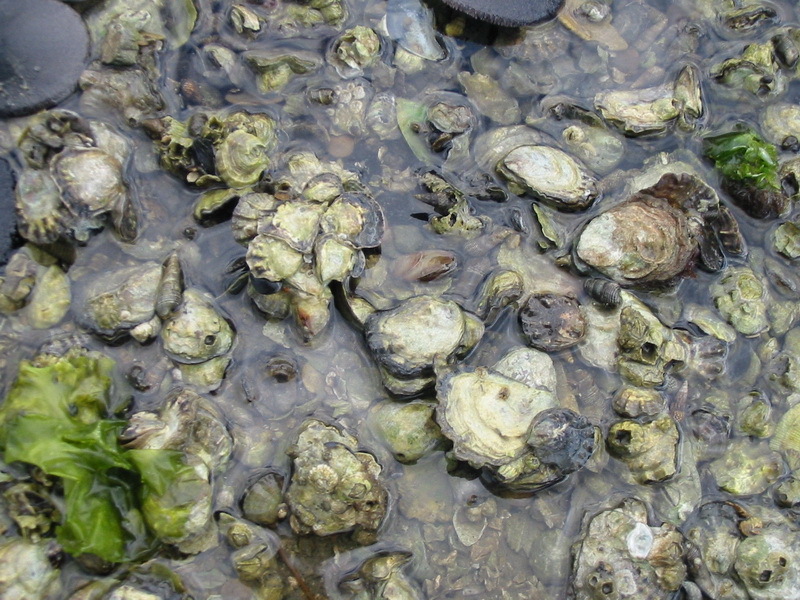 Native shellfish in nearshore ecosystems of Puget Sound. Technical report. Puget Sound Nearshore Partnership. 26 pages.